Feminine Spirituality explains the actual meaning of the feminine nature as revealed in Indian scriptures. Still, several misconceptions about women remain within spiritual circles. Whether it is explicit or implicit, women often undergo discrimination or mistreatment based upon having a female body. The primary reason for this is not understanding the feminine nature of spirituality. From a spiritual perspective, both male and female are feminine whereas the gender belongs to the physical body only. For this, Indian scriptures have described how the behavior of women-in-love reflects the spiritual journey of humanity, the soul’s longing for oneness with the Divine. This is beneficial for both men and women as it enables us to connect with our inner feminine self — our real Beauty. Jaya Devi (PhD Sanskrit) is the founder of the Center for Feminine Spirituality. Her desire is to encourage and inspire those on the journey of feminine spirituality for which she is writing books, maintaining the website www.yourfemininespirituality.org and giving retreats at the Jiva Institute in Vrindavan and worldwide. Jaya left her home country Belgium and embarked on a bicycle tour to search for a deeper experience of love. Her quest remained unfulfilled until she found her spiritual home in India. In 2006 she became a disciple of Sri Satyanarayana Dasa Babaji, the founder-director of the Jiva Institute of Vaishnava Studies, Vrindavan. She then joined the ashram at the Jiva Institute where she has been the Secretary for the past ten years. She manages the ashram and library along with coordinating their seminars and cultural activities. During this time, she wrote From Taj to Vraj, a Feminine Spiritual Odyssey which describes her experiences during her world-wide bicycle tour. Jaya Devi co-authored two booklets with her guru namely, The Yoga of Eating and Spiritual Health, which are published by the Jiva Institute. She has also published two books, the Bhagavad Gita and Hitopadesha, translated from Sanskrit into her native Dutch language with Professor Winand Callewaert, D.lit. reader. Satyanarayana Dasa Babaji (PhD Sanskrit) is the main inspiration behind the Center for Feminine Spirituality. His unremitting compassion for the spiritual advancement of women is a constant and profound encouragement for this project. Since childhood, he was drawn to the spiritual teachings and culture of his home country, India. He grew up in an Indian village near Faridabad, Hariyana, where he enjoyed a happy childhood within a traditional family framework where he experienced the importance of women as the foundation of society. After receiving a postgraduate degree in 1978 from the prestigious Indian Institute of Technology (IIT) and working in the USA for four years, he returned to India. He studied the formal systems of Indian philosophy known as Sad-darsana for more than twenty-five years under the direct guidance of his guru Sri Haridas Sastri Maharaja. 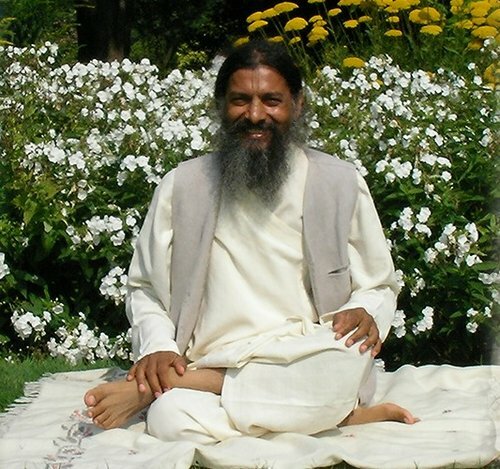 In 1991 he accepted the traditional Vaisnava order of renounced life, babaji-vesa. In 1998 he established the Jiva Institute of Vaishnava Studies in the holy place of Vrindavana where he teaches Sanskrit and various Indian scriptures. His main focus has been the translation of the works of Jiva Gosvami, particularly the Sat-sandarbhas, a series of six treaties on Srimad Bhagavatam. He also has four shastric degrees, a law degree and a PhD in Sanskrit from Agra University. For the last ten years he has been teaching at different institutions and universities in Europe and the United States. Satyanarayana Dasa Babaji has started the ongoing Bhakti Tirtha Course, which everyone can attend during the yearly winter sessions running from October to March. Satyanarayana Dasa Babaji has been honored for his extraordinary contributions in spreading Vedic culture both in India and internationally. In 1994 he was honored by Dr. Shankar Dayal Sharma, the President of India, for his translation of Jiva Gosvami’s TattvaSandarbha. In 2012, he was awarded the Sahitya Sammana trophy and certificate of honor by the present President of India, Honorable Pranab Mukherjee. In 2015, the IIT Delhi Alumni Association honored him for his outstanding contribution to social welfare. Manjaridasi (LLB, Auckland, New Zealand) is the co-founder of the Center for Feminine Spirituality and the senior editor and contributor of the website www.yourfemininespirituality.org. She is the editor of From Taj to Vraj and is a member of the editing board of Jiva Institute of Vaishnava Studies. She is the author of Gauradesh, a Devotional Guidebook on the holy place Navadvip, India and Death Divine which illustrates the life and death of several women spiritual seekers. She is a disciple of Sri Sri Ananta Das Babaji Maharaj and lives in Radhakunda, Govardhan, twenty kilometers from Vrindavan. Her desire is to help others through sharing knowledge of the divine and to give support and shelter to women spiritual seekers for which she has constructed a small traditional ashram in Radhakunda. Maria is the coordinator of the Center for Feminine Spirituality. Her aim is to promote the principles of Feminine Spirituality to women worldwide as the proper understanding of women’s nature and role has the potential to improve the quality of life. Maria was born in Italy and pursued her studies in different countries. She earned a Masters in Pedagogy with focus on intercultural studies from the University of Cologne, Germany. She also accomplished an Ayurveda Therapist Training at Chakrapani Clinic in Jaipur, India. During Spiritual Well-being Weekends in India and abroad, Maria teaches Ayurvedic life style principles such as self-massage and self-face massage. Ananga Manjari is the coordinator of the Spiritual Well-Being Weekends. She was born in France where she studied Ayurveda at Terre-du-Ciel. She is a qualified Ayurvedic Practitioner and Consultant. Ananga Manjari's inspiration is to create more awareness about the principles of Feminine Spirituality as a powerful foundation of society. During the Spiritual Well-Being Weekends, Ananga Manjari teaches Jivananda Yoga exercises, Ayurvedic life-style principles such as self-massage and how to create a personal diet scheme. Raseshvari Dasi from Chile arrived in Vrindavan in 2009. She spent the next seven years travelling around India seeking the association of saintly persons and their spiritual teachings on pure devotion to God. She then returned to Vrindavan and has spent the last few years serving this holy dham by promoting social and environmental issues and helping the cows who live on the streets. She also meets with different government officials including the Chief Minister of Uttar Pradesh to improve the environmental situation. Raseshvari promotes the programs and projects of the Center for Feminine Spirituality and manages our Facebook-site Spiritual Femininity. She also facilitates women devotees through personal support, encouragement and helping them to fulfill their spiritual aspirations. Raseshvari has also learnt spiritually orientated theater, freelance artistry, dance, music, painting and collage tapestry. Today, she is furthering her devotional artistic skills as a formal student of Hindustani classical music. She studied Vedic Psychology from Satyanarayana Dasa Babaji. At the Center for Feminine Spirituality she combines the Eastern and Western science of the mind and gives workshops on topics related to women`s psychology. Kamala Devi teaches cooking for health and explains the importance of cow seva and organic gardening in spiritual life. She explains how cows are exemplary givers of feminine love, especially when they take care of their new born calves. Cows provide milk not only to their calves but to all of us. Cow seva is a simple, yet great means to connect with the Divine. Priyanka Pandey teaches Indian devotional dance and the art of making devotional jewelry at the Spiritual Well-Being Weekends. She received a Masters degree in Art from Kanpur University and a degree in Naturopathy from Akhil Bharatiya Prakritik Chikitsa Parishad College, New Delhi, India. Priyanka likes to encourage women to learn devotional dance which is a powerful means to connect with themselves, others and the divine. Anna completed her degree in Biomedical Sciences in Cardiff, Wales. She worked in the microbiology department for a couple of years at the University Hospital of Wales, Cardiff. Then she decided to study Shiatsu with Kazunori Sasaki Sensei. She is a qualified Shiatsu therapist especially concerned with women’s health. Since childhood Anna took interest in Yoga, she studied Hatha Yoga with her teachers for eighteen years.